If you’re looking for a fun, quirky and memorable wedding invitation then you can’t go far wrong with the Filmstrip invitation from Blush Stationery! Not only will this lighthearted invitation inform your guests of your upcoming wedding, but it will also take them on a special journey of your choice. 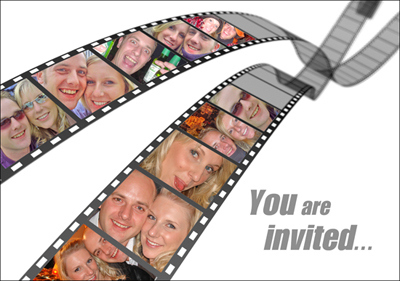 Whether you choose to start off with some embarrassing childhood snaps, right through to your awkward teenage years and into maturity, or you decide to document the journey of your relationship, the Filmstrip invitation is a highly personal, exciting and fun way to invite your guests! If you and your partner have been travelling or if you said ‘yes’ somewhere a little unusual or exotic, you can use this quirky style of invitation to set the scene and involve your guests in your love story, making them feel like an important extra in your very own movie reel! We think this invitation would be ideal if you’re planning a movie, film star or celebrity inspired wedding complete with red carpet and photo booth; you could even dress up as your favourite action hero and leading lady for the filmstrip pics or provide super hero props for the photo booth! Not only can you decide what story to tell with your very own filmstrip of memories, the background, fonts and wording are also totally customisable, leaving you in total control for that all important personalised feel. With space to display all the important information including RSVP details and even any fancy dress specifics, you won’t need any fussy pieces of loose card, keeping costs down and smiles up! Say cheese!